The discovered attack is a very effective tactical procedure. It involves the use of two pieces; when a piece is moved, it frees the direction of the second one so that this one can attack its objective. The power of this procedure lies in the fact that it can attack two places at the same time: first, it attacks with the piece whose path has been released and second, it could attack with the piece that has been moved. That means that if the attacked player can't defense both objectives he will lose something. That is why, sometimes, the player who performs this procedure can sacrifice a piece knowing that he will recover it with an advantage or that he will checkmate the opponent! A particular form of this attack is the discovered check (when the piece whose path is freed, checks the king) or the double check (when both pieces checked the king). I will show you a few examples so you can get a better idea how this is done. In the next example Black moves 1... Re1. With this move he released the queen's path, which is now threading checkmate at a1, and in the same time moved the rook to the strategical square e1. Now White is unable to take the black rook 2. R:e1 because of the checkmate 2...Qa1 nor he is able to protect himself from the queen's checkmate with Kb1 because then R:d1 checkmate. 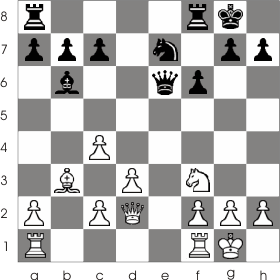 White has, however, the move c2-c3; and with this he manages to defend his position! 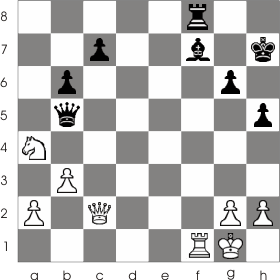 In the next example the pawn from c4, when moved, will create a lot of troubles for Black: 1. c4-c5. This way he frees the b3 bishop and attacks the black bishop from b6. 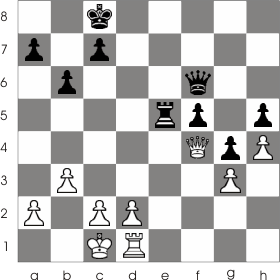 The queen is unable to move because she's pinned to her king by the white bishop; the only move that can save the queen is 1... Ne7-d5, and so the queen is made safe. 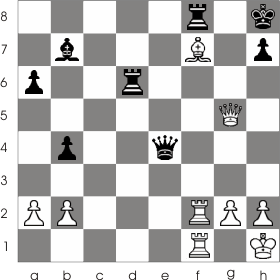 But, unfortunately, this didn't save the bishop: 2. c5:b6 and White wins a bishop. The following game was played in 1934, at Hastings, between Euwe and Thomas. White plays 1.Bd5. This is a good move; not only it threatens to capture the queen but also to checkmate at the second move with R:f8. If Black tries 1... R:f2 then 2. Qg8. Black has no escape from this nasty situation! I said earlier that a particularized case of the discovered attack is the discovered check. The next position shows you what this mean. Black makes a surprising move: 1...Qb5:f1!. The white king has no choice but to capture the queen 2. 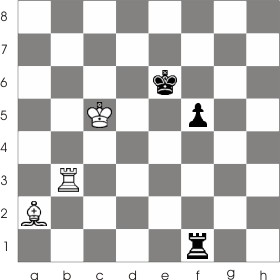 Kg1:f1 and thus entering under the potential range of action of the rook from f8. Now Black performs the discovered check 2... Bf7:b3+ 3. Qc2-f2 Rf8:f2 4. Kf1:f2 Bb3:a4 and ends up with an extra bishop and an extra pawn. The first move Black made is a part of a tactical procedure called deflecting. We'll talk about it later. In the next position White takes advantage of Black's bad position and makes a discovered check 1. Rf3+ (or Rb1+) and black loses the rook.